Make a Quick Quiche recipe everyone will love! Quick Quiche is my to go recipe any time I don’t feel like cooking anything too complicated. It’s easy and quick enough to make for weeknight dinners. It’s also my go-to recipe as a way to use up leftovers from the previous nights’ dinners. Waste not, want not, right? This quick quiche recipe also comes in handy for entertaining. I serve it for breakfast, brunch parties, brinner (breakfast for dinner), and bring it to potluck parties, too. Just serve it with a simple side salad. This simple quiche recipe can be made gluten free, dairy free, vegetarian, or a meat lover’s delight. You can also double the recipe and freeze one for later! My quick and easy quiche recipe is a dinnertime classic at my house. My kids always look forward to “quiche night” and ask for seconds. They’ll even eat leftover Quick Quiche for breakfast and take it to school for lunch. It’s simply the best simple quiche recipe ever! 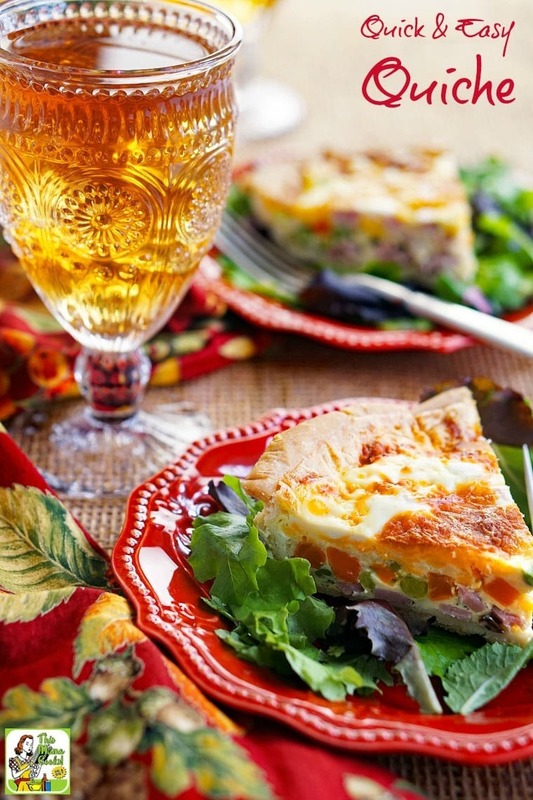 Tips for serving this quick quiche recipe at your next party! 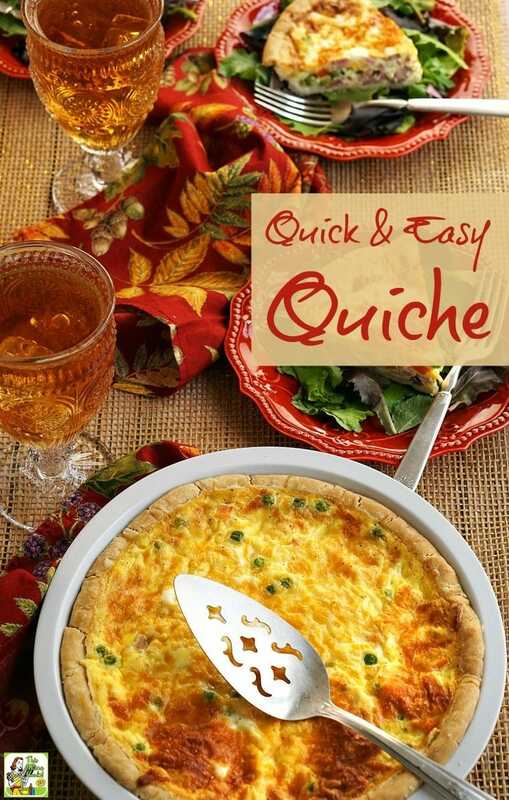 Quick Quiche is an ideal party appetizer or meal because you can make it in advance. Just refrigerate and reheat in the microwave before your party. If you want to give the impression that you made the quick and easy quiche from scratch, here’s a quick and easy party hack. First, make sure your Quick Quiche has been refrigerated for several hours so it’s really solid. Then carefully flip over the cold quiche on to your hand to remove the aluminum pie tin. Then flip the quiche back over into a ceramic pie plate. (See my pictures.) 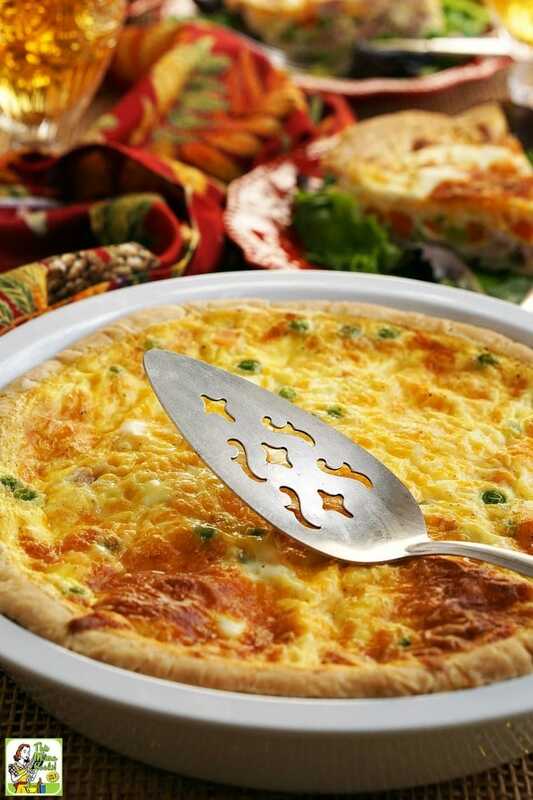 You can even precut the quiche into ideal serving sizes for your party before reheating it in your microwave. For the store bought crust, you can use pie shells found in the freezer section of your store. If you’re gluten free, many grocery and health food stores now carry premade gluten free pie crusts. Look for them in the freezer section, too. Prebake the rice crust at 425 degrees for 15 minutes. If you’re trying to eat less fat, instead of three eggs, you can use one whole egg and four egg whites. Time saver: use liquid egg whites – no need to crack open eggs and toss the yolk! Follow the package directions to determine amount equivalency. Usually 1/4 cup of liquid egg whites equals one full sized egg. Cheddar, Swiss, Monterey Jack, Mexican three cheese blend, or any combination of hard cheeses works in this simple quiche recipe. Low-fat cheeses are OK to use. If you need to avoid dairy and can’t eat cheese, you could try vegan shredded “cheese” as long as it melts well. Time saver: buy your cheese already grated. If you’re gluten free, make sure that the anti-caking agent used on shredded cheese (to prevent it from sticking) doesn’t contain wheat. Check the label or the manufacturer’s website to make sure your favorite shredded cheese brand doesn’t contain gluten. Any type of cow’s milk will do – whole, 2%, 1% or skim. You can also use evaporated milk, half-and-half, cream, or even plain yogurt or plain Greek yogurt. Yogurt can be pretty thick, so you may want to add a little water or milk. If you need to avoid dairy products, use unsweetened soy milk or coconut milk. What I love about my Quick Quiche recipe, is that it’s so versatile. You can use leftovers from the previous week’s dinner or new ingredients. Crunchy, fresh vegetables (like peppers, onions, etc.) and meats should be precooked. Softer vegetables like tomatoes and mushrooms don’t need to be precooked. Time saver: use frozen or canned vegetables. 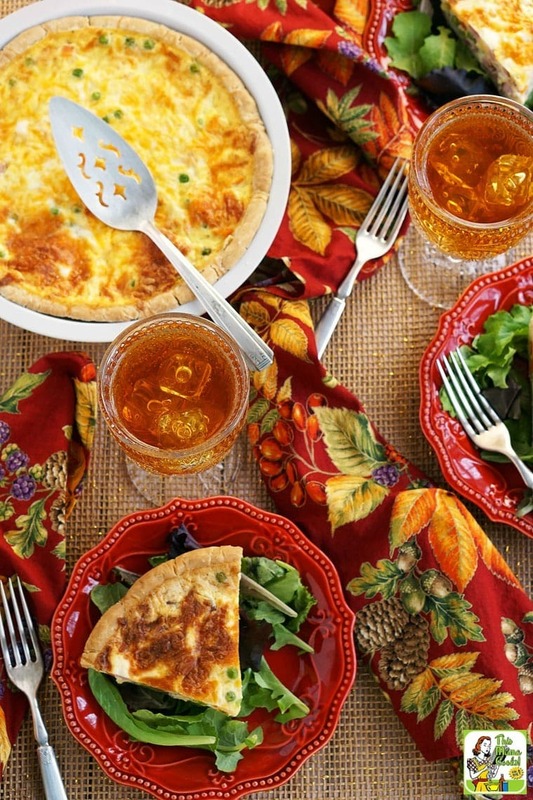 Make sure to defrost and drain veggies before adding them to this simple quiche recipe. You don’t want your quiche to get soggy! No need to precook these vegetables as they’re usual pretty soft. Have fun and experiment with different food combinations when putting together this easy to make quiche recipe. Good combinations are ham and mushrooms, bacon with broccoli and mushrooms, turkey and tomatoes, imitation crab and onions, etc. Try going completely vegetarian or using seafood. 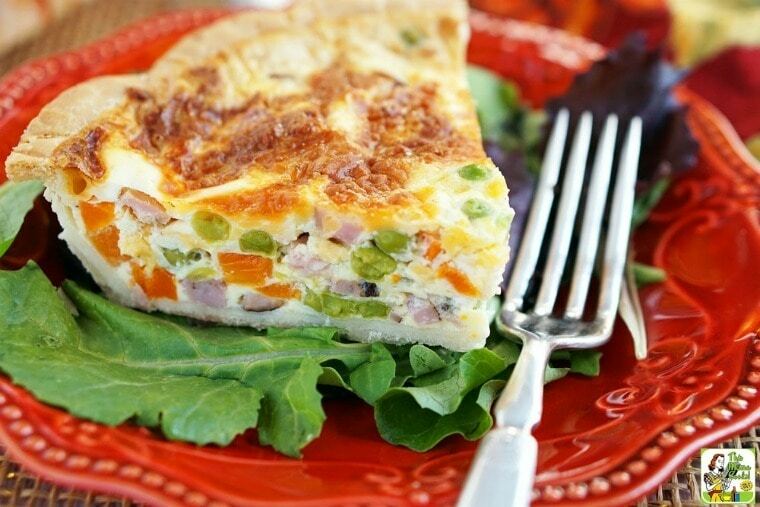 If you and your spouse want a shrimp and onion cheese quiche for dinner, make a second quiche with ham plus frozen peas and carrots for the kids. I don't add salt to the quiche if I'm using a salty meat such as bacon or ham. I suggest adding no more than 1/2 teaspoon salt and 1/4 teaspoon pepper if you’re using turkey or chicken. Dill is wonderful in seafood quiches, so add a teaspoon or two! Place the premade pie crust on a baking sheet as your quick quiche may leak during cooking. Grate cheese, if necessary, and cut the filling ingredients into small pieces. In a medium bowl, beat eggs, milk and seasonings together until just combined. Spread filling ingredients in crust, top with grated cheese, and cover with egg and milk mixture. Slide baking sheet into oven being careful not to spill. Bake for 10 minutes at 425 degrees F. Then turn down the oven to 350 and bake for 45 minutes or until golden brown. Remove the quick quiche from oven and cool 15 minutes before slicing and serving. Originally posted on December 26, 2016. Updated with new pictures and information. Posted in Breakfast, Gluten Free, Recipes and tagged egg recipes, party food on January 12, 2018 by Anne-Marie Nichols. Try this Easy Edamame Hummus recipe at your party!